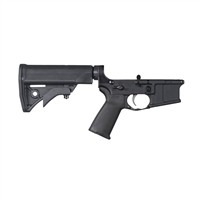 The Aero Precision AR15 Gen 2 Stripped Lower Receiver is the perfect base for your custom AR15 build. Machined to mil-spec dimensions, these lowers work with standard AR15 components. The M4E1 Lower Receiver delivers billet aesthetics in a forged package. This custom designed enhanced forging is machined from 7075-T6 Aluminum and compatible with all mil-spec AR15 parts. Spikes Tactical stripped lowers are made to the highest standards. If you are planning a build or just putting lowers away for a rainy day you can't go wrong with Spike's lower receivers. LWRC dual control fully ambidextrous lower receiver includes bolt catch and release, magazine release and fire control access from both sides.